I’m not down with the sickness | I'm Gonna Cook That! I’ve had a stomach thing the past couple of days. I ate fast food fried chicken on Saturday, and without getting too graphic, my body rejected it. I should have known better. Since I’ve had my gall bladder out, I’ve had to be careful about eating high fat foods because… well… I promised I wouldn’t get graphic so… reasons. Anyhoots. I cooked one thing this weekend, because I had a deadline for this really cool thing I did that I’ll tell you about on Friday. In the meantime, I thought I’d share some good recipes for that “just getting over an unhappy tummy” thing that happens when you are not quite feeling better but you don’t feel as bad as you did before. Of course, ideally someone else is there to make these things for you, but since no one has shown up at my door with declarations of undying affection and a bouquet of wooden spoons or a Kitchen Aid stand mixer yet, I guess I’ll just call these The Foods I’d Like To Have If I Felt At All Like Cooking Food. Ginger is known for it’s tummy soothing properties. I always carry ginger tea with me when I travel because I get air sick and car sick kinda easily. This Cleansing Ginger-Chicken Soup from Bon Appétit is packed with ginger, but not a lot of other complicated flavors that might irritate a delicate stomach. The active component of mint, menthol, works as an anti-spasmodic and muscle relaxer, which can help calm stomach cramps and relieve nausea. Of course, the easiest way to get a little mint inside you is mint tea, but if you’re not a tea person, try modifying this Mint, Basil, Cucumber, and Lime Fizz I found on Yummly.com. I say modify, because this recipe as its written calls for a lot of sugar so I’d probably cut that down quite a bit because you don’t need to load your system with a lot of sugar at this point. But, the mint and cucumber, combined with the stomach settling effects of the bubbly water, sounds pretty soothing. Once you’re ready to start introducing more solid foods, you might start with this Quinoa Salad with Lime and Fresh Mint from the Gluten Free Goddess. After I’m done being sick, I still don’t want anything too heavy or processed for several days. This salad sounds clean and fresh, and can be customized to whatever fresh veggies you have on hand, just in case you’re not ready to face the masses at the grocery store yet. You can start with a small portion and see how you do before moving on to regular food. Another snack sized option is this recipe for Fresh Spring Rolls I found on RawFoodRecipes.com. If you’re like me, you almost always have a cucumber and some sort of lettuce/salad green type something in the fridge along with some other basic salad/stir fry veggies, so this is another one that can be customized to whatever you have handy. I have a kitchen lab at school tonight and tomorrow night, and to be honest, I’m not exactly looking forward to having to do a lot of cooking just yet. I’m going to volunteer to take care of any veg recipes, and let the other folks on my team deal with the heavy stuff. Hopefully by tomorrow I’m mostly back to normal and I can get excited about Roasted Meat week. If anyone has any other ideas for “post-stomach thing” foods, feel free to drop me a line in the comments! Hope you’re all better soon! I am like Nikki, I always revert to saltines and buttered toast with tea for some reason. Probably old wives tale. Or thats what my parents always gave me. If solid food is not in the cards something I do outside of soup is yogurt. I’m not sure if dairy is a problem, but it seems to be okay for me. If I had someone to make it for me, the ginger chicken soup would be super awesome! Feel better!! 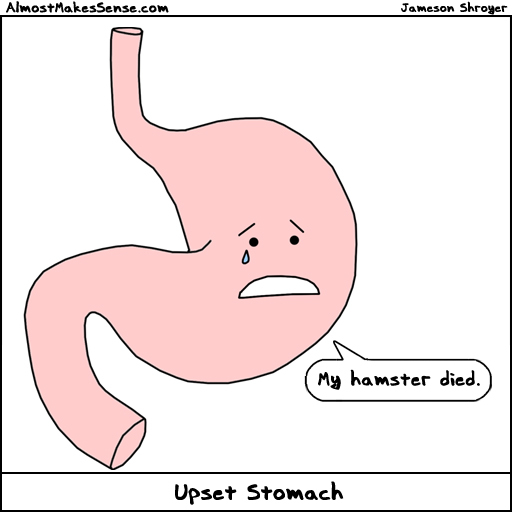 I share the gallbladder um…sensitivity?…and it’s a pain in the…well, you know. I usually start with saltines and then move on to plain buttered toast…can’t stand chicken soup, Sprite, or popsicles, I will usually make homemade potato soup on day 3 or 4 of a stomach bug recovery. Hoping you feel better! !